Peter Parker and Mary Jane Watson are getting married! But Kraven the Hunter is going to make sure the wall-crawler ends up six feet under... literally! It begins with an all-time classic encounter with Wolverine that changes Spidey's life forever, and leads to the death of one of his best friends! In the wake of tragedy, Peter pops the question - but the honeymoon will be short-lived, as Kraven goes to extreme lengths to prove himself better than his greatest foe! The Hunter will learn that it's one thing to defeat Spider-Man - but quite another to expect him to stay down! 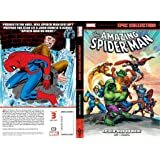 Start reading Amazing Spider-Man Epic Collection: Kraven's Last Hunt on your Kindle in under a minute. I didn't do much homework before buying and looking at this book, I was just expecting the Kraven story, I didn't realize the collection would include several stories that preceded, and I was very pleasantly surprised by the high quality of all the stories. The stories before "Kraven's Last Hunt" are great, pretty standard Spider-Man stuff but very well done and enjoyable. I especially enjoyed the issues with Wolverine, unusually dark and really excellent story telling. There were a couple of issues that weren't very interesting to me mixed in there, but it's also a huge collection so a couple stinkers make the rest smell better. There's probably not a lot I have to say about "Kraven's Last Hunt", if you do any research you'll see how well regarded it is. For me, it was easily the best made, most enjoyable Spider-Man story I've ever read. I couldn't believe how dark and psychological the story and artwork is. Truly a comic book masterpiece in my opinion and pretty much everyone else's who I've ever spoken to. If you're a comic book fan and/or Spider-Man fan to any degree there's no reason not to get this collection. The original volume of the Amazing Spider-man has a way of immersing the reader in Peter Parker's life which few other comics have been able to pull off with their characters. His life is constantly moving forward, and the stories all seem to contribute to a single, overarching narrative. So considering that, it's a wonder how a story arc with such a starkly different tone feels so natural set against the backdrop of Spider-man's then twenty-five year history. Kraven's Last Hunt is the best tale from Spidey's best era (the mid-80s on through Micheline/MacFarlane's introduction of Venom). The story sits at a perfect point in AMS history, with more depth than the comics of Stan Lee's run, but without the convoluted crap of the Clone Saga. Absolutely loved how thick this collection was. It provided all the background that previous collections didn't (Spider-man vs. Wolverine, part of the Hobgoblin arc, and even the famous wedding in AMS annual #21). When you actually get to the six-issue storyline, there is much more weight behind it, which makes it all the more satisfying to read. I do wish it could have included an older issue with Kraven, perhaps his first appearance, just to familiarize us more with the character. Regardless, both the artwork and writing are fantastic, and it really makes me hope that the upcoming Spider-man films can take inspiration from this era in the comics. this is one of the stories that transcends normal comic books let alone just for the writing the art alone is superb but the writing is a step above of most comic books that were written in the 1980s and even today. 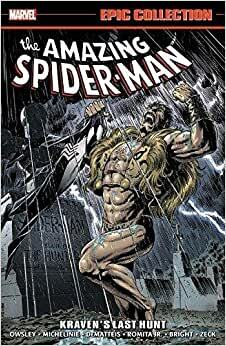 It is my favorite story that I've read of Spider-Man and I've yet to see it topped Kraven was never my favorite Spider-Man villain and I think the use of him in this story and the way he was used was nothing more than perfection the other stories in this collection aren't bad but they're their pale in comparison next to KLH. I bought this book because I wanted to read the Kraven's Last Hunt story. This actually includes the entire story leading up to the event including Spider-Man's meeting with Wolverine, marriage to Mary Jane and some other stories. The actual story of Kraven's Last Hunt was the best Spider-Man story I have ever read and I highly recommend it to any fan of comic books. If you want to know more about how the story was made you can read DeMatteis' forward in the back of the book among the extras that are included. The colors in the book are vibrant and the paper is great quality. 5.0 out of 5 starsClassic! If you're a spiderman fan you already know this book is great, if your not read it (it's a little darker than most Spiderman stories, buy good). Not only does it come with kraven last hunt, but it also has the wedding issues! Get it!